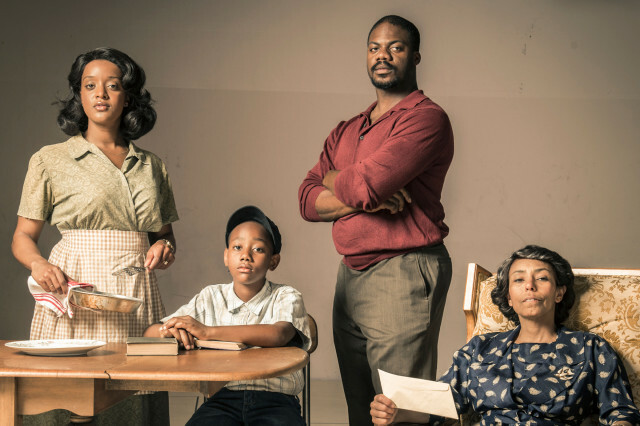 (L to R) Ryan Nicole Peters as Ruth Younger, Zion Richardson as Travis Younger, Marcus Henderson as Walter Lee Younger, and Margo Hall as Lena (Mama) Younger in Cal Shakes’ A Raisin in the Sun by Lorraine Hansberry, directed by Patricia McGregor; photo by Kevin Berne. My husband quickly tucked his blunt under his baseball hat to save for another time as we hiked up the hillside, towards the Cal Shakes theater, to see Lorraine Hansberry’s A Raisin in the Sun. We quickly realized we were the only young latinos among an aged sea of silver and white hair in Orinda, California. He had misread this outdoor venue by a mile; obviously this was not the place for him to blow a hazy low cloud from his swisher, which he had brought from our East Bay home in hopes to pacify him, while I dragged him out to see a play on a Friday night. The last time I had watched a play was back in 2002, when I saw Phantom of the Opera in San Francisco over the holidays with my dad. As far as my husband—perhaps high school or junior high; sometime before 1998? And despite debuting fifty-five years ago—the Broadway production opened in 1959—I was struck by how relevant the play still was today. I was also struck by how the audience contrasted starkly from the characters in the play. Here we sat in Orinda—among wealthy, white, Medicare-eligible couples drinking wine, renting cozy $2.00 blankets to couple up in, enjoying the summer sunset—while watching a play about a black, poverty-stricken family in Southside Chicago. Despite the gravity of the story—which concerns the struggling Younger family, and their anxiety around the arrival of a life insurance check—the cast kept the punchlines rolling. Some jokes that I had thought would be offensive or fall flat did the exact opposite; the sly jabs at white people and their way of life in the 1950s kept the crowd jeering and laughing. I was not familiar with A Raisin in the Sun before this assignment and was sorry I hadn’t heard of it. By intermission, I already felt astonished. As my husband and I trotted to the snack shack to beat the crowd, I could hear many of the audience members commentating on what we had just seen. Many felt sad and sympathetic towards the Younger family; one woman even used the word “broken-hearted.” It made me feel many ways inside too, but not sad nor broken-hearted—strong, motivated, inspired is how I felt; and most of all, reassured. Reassured that my family is not the only family that feels such immense pressure to beat poverty. Despite the fact that we make a decent living between the two of us—my husband has worked for many years at one of the last unionized tech jobs, and I work full-time and earned my B.A. over the course of six long part-time years—poverty is such a slippery slope nowadays that it seems no matter how hard we work, all it could take is a few broken bones or one horrendous illness to send us to the poorhouse. Though I could count many differences from the Younger family and my own, I saw similarities in the necessity of having big, powerful dreams to keep our family secure. In fact, I saw my very own husband in the son Walter Lee Younger, and myself mixed between his wife Ruth and sister Beneatha. Both siblings quarrel with each other over how to spend their father’s life insurance money, awarded to their mother Lena Younger with whom they live. Both siblings dream of bettering themselves and their family: Walter enters into a shady business deal with his friend Willy Harris, a get-rich scheme that goes wrong; Beneatha hopes to go to medical school and learn a sense of self. Even though both fantasize of reshaping their future differently, it’s pretty much the same goal that every family attempts. From the ‘50s to 2014, every family has their own get-rich scheme, and we all ask ourselves the same thing: how can we beat poverty and maintain family, home and sense of self in a society that oppresses so many people in the name of capitalism? Unfortunately, Willy Harris manages to swindle Walter, which results in most of the life insurance money becoming nothing more than an expensive learning lesson for the naïve Walter Lee. At this point the characters become alive; the crowd feels as helpless as the Younger family. Walters and Beneatha’s dreams have been robbed and the Younger family is left with the conundrum of whether to relocate to Clybourne Park, an all white neighborhood on the other side of town, which will use the last of the insurance money. Though Raisin takes place in Southside Chicago, the family’s relocation feels like gentrification in reverse—a “photo-negative” of the gentrification in the Bay Area. Moments after the Younger family learns of their lost fortune, they are greeted by Karl Lindner, a representative of the “welcoming committee” from the all-white Clybourne Park Homeowners Association, who offers them a settlement not to move into the once-out-of-reach neighborhood. Highly-priced homes are driving lower- and middle-class people out of urban neighborhoods around Oakland and San Francisco—while the Younger family broods over whether to relocate to a new residence in a racist neighborhood, yet with a larger environment that would genuinely enrich the youngest Younger, 10-year-old Travis. It isn’t a circle—it is simply a long line—as in geometry, you know, one that reaches into infinity. And because we cannot see the end—we also cannot see how it changes. And it is very odd but those who see the changes—who dream, who will not give up—are called idealists…and those who see only the circle—we call them the “realists”! I would like to think that optimistic Asagai is right about this geometric-line-analogy of life. Perhaps it is the hope that he is sharing with my husband and I, who are still not quite old enough to see progressive changes take place, but not young enough to not notice social changes that are needed. This production dances with many social struggles that are still happening today. The Younger family and Bay Area folk both struggle with the choice to either occupy or not to occupy. Watching one family’s tale helps me understand my own. Check out PopFront’s other reviews here. This entry was posted in Culture, Reviews and tagged a raisin in the sun, bay area, cal shakes, displacement, gentrification, geography, lorraine hansberry, oakland, poverty, racism, san francisco on June 4, 2014 by admin2.